The European Chamber of Commerce (EuroCham) has announced its inaugural CSR Contest and Awards 2019, so you’re a company who want to be recognised for your Corporate Social Responsibility work, then apply before 8 February! The first such contest in the Kingdom, EuroCham aims to encourage and recognise the work that its members are doing in their CSR practices, and to demonstrate the contribution of the European business community to the sustainable development of the Cambodian economy. Companies will be split into four different categories based on their size or assets, so don’t worry if your businesses is small or big. Entries will be judged based on three criteria: generation of impact or creation of shared value, CSR activities management, and innovation. Four winners will be chosen, one from each category. Note that the contest is only open to all EuroCham members or companies that commit to register as EuroCham members before 31st March 2019. Contestants may register for ongoing CSR projects which have already reached the execution phase, or completed CSR projects which are not older than 1 year. The deadline for companies to register is 8th February 2019, while the deadline to submit contest entries is 31st March 2019. 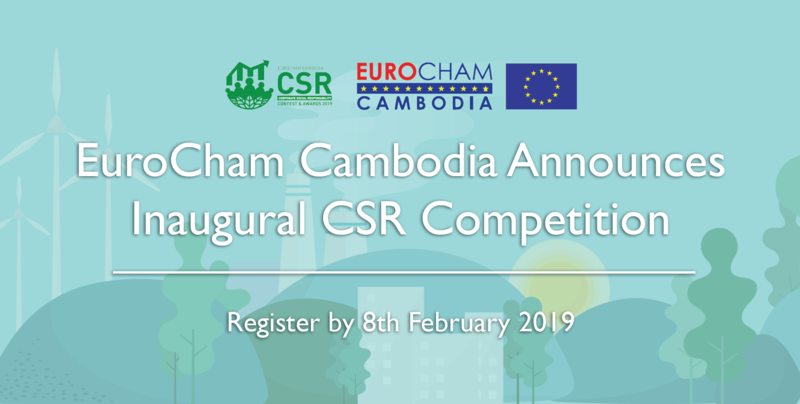 For more details, or if you’re interested in registering, check out the contest’s website, http://www.csr-eurochamcambodia.org/.